The UNDP has installed solar panels for backup power supply in 15 hospitals across Libya (Photo: UNDP). The UNDP has confirmed that it has installed solar panels for back-up power in 15 different hospitals across Libya as well as one municipality building between 2016 and 2017. It plans to install more in other hospitals and public facilities such as schools and municipal buildings in 2018 – subject to obtaining funding. What is UNDP doing in Libya? As the United Nations global development network advocating for sustainable development and inclusive economic growth, one of our main priorities in Libya is to help the authorities to provide basic services to citizens across the country. The intensification of the conflict since 2014 caused critical infrastructure damage, disrupting basic services such as water, sanitation and electricity supply. We are addressing these issues and at the same time bridging the critical period of transition from humanitarian relief to sustainable development. People need water; however, we are not providing them just with water but with an entire water operating system; People need electricity; however, we are not just providing them with generators but also with a clean alternative, solar energy. In this way, we are responding to the urgent needs of the people and providing a long term and sustainable solution. Why is UNDP installing solar panels? Nowadays, many people are aware that renewable energy, specifically solar energy, is an efficient alternative source of power which reduce the carbon footprint and can help a country to insulate from price fluctuations in global energy markets. UNDP’s goal in Libya is to support the authorities to improve access to basic services through ensuring constant and cost-effective access to electricity, while also mitigating the impact of climate change and advancing multiple Sustainable Development Goals. We don’t hear that much about Libyan energy sources outside of oil and gas, however there is a strong potential for solar power in Libya. More than 88% of its territory is desert, the country has long hours of sunshine and its proximal to the Tropic of Cancer which ensures great solar radiation. This solar energy solution decreases the public buildings reliance on the devastated national grid ensuring a continuous -and easy to maintain – source of electricity. This off-grid solution is working 24hrs a day connected to the Grid in Emergency cases (Cloudy periods) if needed. The system can be described in two main sub-systems, the production of electricity using solar panels & Energy storage using some high capacity batteries. If this system is introduced widely in Libya, it can contribute to the reduction of carbon emissions, providing a long term and sustainable solution, while addressing the imperative needs of the people. Between 2016 and 2017, UNDP provided solar panels to 15 hospitals and one municipality building. Libya has been witnessing major power disruptions which left many hospitals in the dark literally. Health facilities need power to operate life-saving medical devices. When there is not electricity in clinics, maternity wards, operating rooms, medical warehouses and laboratories, lives are at risk. The primary objective of UNDP’s support to hospitals is lifesaving, which can be achieved introducing clean and environment friendly technology during this critical time for Libya. With the installation of solar systems in health facilities we are providing more patients with access to medical care through a stable, clean and reliable energy supply. Our aim is to help save lives and using solar panels for the health sector is proving to be a very smart choice. Renewable energy is a means by which health systems can increase resilience to the challenges presented by climate change. The installation of solar systems will reduce greenhouse gas emissions and will lower power bills. The saved money could be used to support other health priorities. If we manage to scale up this system to more and more hospitals in Libya, we will be helping to save lives through a sustainable system. 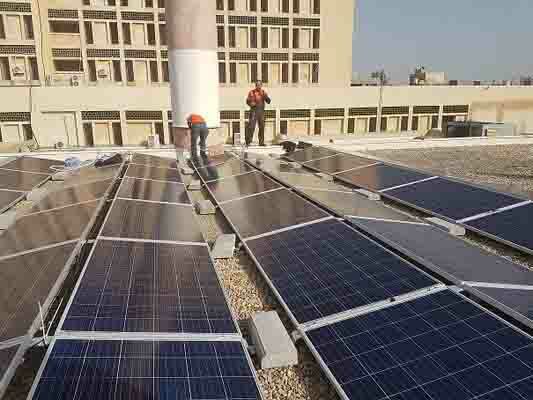 During the crises in Libya, UNDP decided to harness this clean energy and install solar energy in health facilities to give power supply continuity in a time that health facilities are facing power interruption during critical surgical operations, as well as heating needs and refrigerating critical medicines. Due to the conflict, now people are facing challenges to access to health services. It is now when they need a swift response and with the solar systems we are providing both a swift and a long-term solution. What has it been done so far? The need for support to hospitals came in response to the UN humanitarian assessment of 2016, which showed the disruption of electricity as a major concern in Libya affecting many sectors, including the health sector. We started to install solar system in hospitals in August 2016 and currently, 15 hospitals are benefiting from the solar panel support, four are in Tripoli, four in Benghazi, three in Zintan, two in Ubari, one in Rujban, south-west of Tripoli, and one in Sebha, a city in southern part of Libya. Out of 19 small health centers located in the city, Sebha’s hospital is the main health center which services neighboring towns too. But there are more hospitals and public buildings that need this system. With more funding, we could scale up this programme to provide support to more people. What you have achieved already? Patients using these hospitals have now access to uninterrupted health services. The capacity for each hospital is between 15 and 20 KVA and the system is modular and can be upgraded to tens of times of its capacity, if the needed space for the upgrade is available, whether on the roof or on a ground fields. Meanwhile, other system components can be upgraded as well, like the batteries bank and Inverters. What needs to be done still? So far, the funding covers 15 hospitals though the needs are much bigger for hospitals to fully function their critical units. 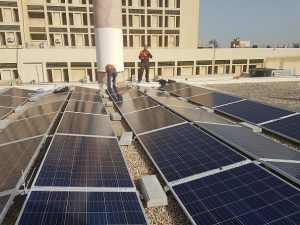 If more funding is made available, UNDP Libya hopes to install solar power panels in other hospitals and public facilities such as schools and municipal buildings. What are the main challenges that UNDP is facing? We faced some logistical challenges, especially in places like Benghazi, a war-ton city. However, the hospital personnel were very thrilled to have this new energy system. Even though, some of them did not know about it before, they were all very excited about this initiative and they were engaged in the process since the beginning. How are the solar panels helping the people in Libya? UNDP has been informed by doctors that power used to go off during surgical procedures and they had to stop the operation until the generator was turned on and this was putting at risk the patient’s life. However, since the solar panel were installed, they are continuing the medical procedures without interruption. They also mentioned that equipment such as ventilators and anesthetic machine that were at risk of damage due to the power cut, are now safe. For example, during the blackout of power grids in all major cities of Libya, the ICU unit in Abusleem hospital in Tripoli was fully functioning using solar energy. They were using the direct solar power during the day and during the night the system switched to the power stored in the high-capacity batteries, so there was no cut whatsoever. The system is not only providing them with a sustainable long-term energy solution, but is also helping them financially because the electricity bill will be reduced thanks to the solar grid. Solar system in health facilities can also help Libya to achieve some of the Sustainable Development Goals such as good health and well-being, affordable and clean energy, climate action and partnership. It can also make a significant contribution to the 2030 Agenda for Sustainable Development and its commitment to ‘leave no one behind. With more funding, we will scale up this programme to answer critical needs of more people in Libya through a long term and sustainable system. What are UNDP plans for 2018? Scaling up the programme all over Libya, the Solar Energy Investment aims at achieving complete coverage of the electricity requirements for 20% of Primary Health Care Health Facilities in Libya and 83% of hospitals for emergency wards, operating theatres, delivery rooms, pharmacies and laboratory services as well as coverage of close to 200 other health facilities such as NCDC branches, dialysis centres, dental clinics, etc. This would greatly improve both the access to and the quality of health services while reducing the operational costs. Between 2016 and 2017, under The United Nations Central Emergency Response Fund (CERF) and the Stabilization Facility for Libya (SFL), UNDP installed solar panels in Tripoli at Abu-sleem Hospital, Ali Omar Askar Neuro, Cordoba Center for Services, and Tripoli Heart Center; in Sebha Hospital; in Benghazi at Al-Kwefia Hospital, Al Gwarsha clinic and Dermatology Hospital and in Kikla Municipality. The solar systems in Zintan General Hospital, Rujban Hospital, Zintan Emergency and Surgery center, Ubari General Hospital, Ubari General Hospital Dialysis department and Zintan Obstetrics and Gynecology Hospital were installed under the umbrella of the National Oil Corporation sustainable development program, funded by Repsol and implemented by UNDP.